I’ve already been a week in Beijing, the lovely, oriental capital of China and I’m enjoying every minute of my visit! The weather is warm and balmy and classical Chinese building dot the city landscape, surrounded by tall, bright skyscrapers. I can’t get enough of the melt-in-your-mouth Beijing Duck and walking around the beautiful, peaceful parks. I especially found the Summer Palace to be exquisite and the Forbidden City was impressive and fascinating at the same time. QR Codes have also accompanied me along on this trip, appearing wherever I go, no matter if it is a touristy area or a local area. QR Codes seem to be as much a part of the culture here as chopsticks and are considered to be a crucial, useful technology for all posters and shops. I love to walk across the elegant Tiananmen Square and scan the QR codes that pop up in every poster on the streets around. One of my favorite places to spot QR Codes is in the metro, where they appear on the metro ticket and dot the metro walls in various advertisements. QR Codes in China seem to be much more advanced than in the West and companies strive to make their QR Codes noticeable and memorable by placing them in the center of the designs and posters. Colorful QR Codes are the norm and many companies take it one step further by adding in their logo over the middle of the QR Code, although that often disrupts the scannability of the code. 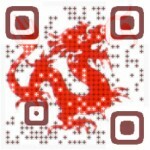 We have great hopes for Visualead, or Shijuema (as our Chinese company is called) in China, as it is obvious that the Chinese companies are in dire need of a smooth, visually appealing solution for their ubiquitous QR Codes. It’s fun to muse upon the future of Visual QR Codes in China, as I scan the code on my ticket on the way up in my cable car, gazing down upon the Great Wall winding its way through the misty mountains. The next stop – Shanghai!